Dear Birdsquatch: I have a question about hummingbird nectar. When making the sugar water (in the proper 4:1 ratio, of course), I usually make a big pot—enough to fill 10 16-ounce Mason jars, which I keep in the garage fridge. Today, when I was filling the backyard feeder, I noticed black fungi floating in ALL of the jars. I always clean with soap and water and even bleach the jars a bit. But I still occasionally get mold. Do I need to make fresh solution each time I clean the feeders? Save Your Eggshells for the Birds! Here's one weird, but true way to help birds during nesting season: Save your eggshells and offer them to your avian visitors. Female birds need calcium—especially during egg-laying season. ????? ?Bird Watcher's Digest An enormous thank you to Pete Dunne and National Audubon Society for sharing this moving tribute to BT3. ?? Ask Birdsquatch: How Do You Estimate the Number of Hummingbirds Visiting a Feeder? Dear Birdsquatch: I would love to know how many hummingbirds are visiting my feeders. My wife says there are about a dozen, but I'm thinking there are many more. It's hard to count the little buzz bombs because they rarely sit still. Is there a way to count them accurately? Want to watch the progression of hummingbirds in North America? Check out these websites—and if you see a hummingbird in your area, consider reporting your observation! Don't expect a jay or hummingbird to use a birdhouse you provide. Only "cavity nesters"—bird species that naturally nest in hollow trees or similar secluded shelters—will select a human-provided nest box. And not all cavity nesters readily adopt boxes. Who doesn't love spring? Flower buds are pushing up through the soil, birdsong is filling the air, trees are just starting to leaf out, and there's a promise of fair weather ahead—what's not to enjoy? The "usual suspects" are still at our feeders, since their natural food sources are not yet as conveniently available as the free fare we provide. However, be sure to look beyond your bird banquet for even more joyful signs of spring. You don't need to be an avid birder to notice that birds make a wide variety of sounds. Some of these sounds are gentle and pleasant, like the beautiful phrasing of a newly arrived wood thrush in spring. Other sounds can be jarring and annoying, at least to a nonbirder, such as the loud mechanical imitations of a northern mockingbird on a summer night. Have you considered renovating your backyard to be more comfortable for birds? WBB contributor Elizabeth Bacher offers 11 ideas to make your property more appealing and safer for your feathered friends. Ask Birdsquatch: An Unbearable Problem! 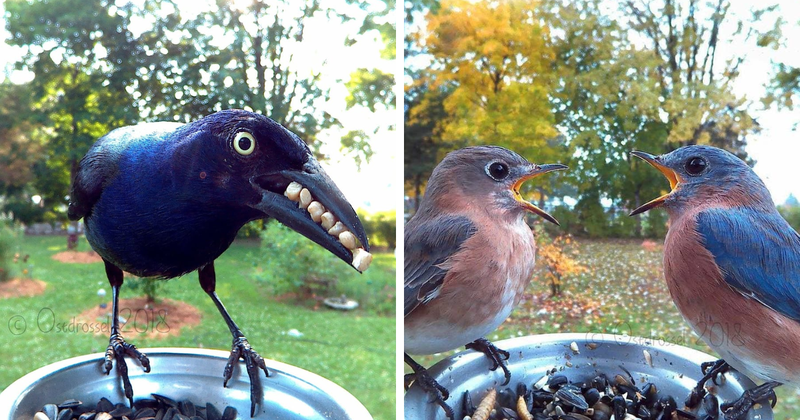 Dear Birdsquatch: We have a cottage in the woods in Pennsylvania and we enjoy feeding the birds there. One problem: Bears. I've tried everything I can think of to keep the feeders away from the bears, but they always empty them and sometimes even destroy them. If you can tell me what to do to keep the bears from my bird feeders (including my hummingbird feeder), I would be most grateful.